Oh what fresh hell a party can bring. Who would have ever thought that Howard becoming family would be the least of it? I don’t think Alicia could have dreamt that scenario up in her worst nightmares. 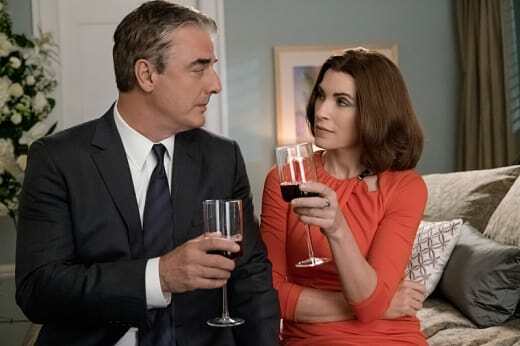 Of course The Good Wife Season 7 Episode 20 had plenty of unexpected moments; some sad, some comical. I was proud of Alicia for ignoring everything – including the door – and telling Jason how she felt about making him a priority. Unfortunately, it seemed to blindside him. His surprise gift of 500 acres on Mars was sweet and funny but poorly timed. I loved how he tried to explain it later about how he loved outer space and he thought it was a cute gift. That says something about their relationship, that he’s trying to share that little portion of himself with her. But I completely understood Alicia’s reaction right after he handed her that box. She was so lost. She was trying to have a serious talk about their relationship, and he gave her land on Mars? Perhaps poor timing is an understatement. Lucca was correct in that Alicia has gotten under Jason’s skin. It was great to see Alicia and Jason both being honest. They want a future with one another; they’re just not certain what that would look like or if it’s even possible. The best part for them is that there’s no need to make those decisions just yet; for now, asking the questions is enough. But for the sake of the audience, I hope we get some answers before the series ends. The party was just what I’ve come to expect from this series, ridiculous fun mixed with unexpected twists. The moment Zach said he had news I knew he was engaged and it was wonderful seeing Peter and Alicia basically mocking their son. I’ve never liked Zach, and now he’s more pretentious and annoying than ever. I almost couldn’t believe his accusatory tone when he found out his mother was having a relationship with Jason. Is he completely blinded to his father’s faults and his parents’ farce of a marriage, or does he hold some sort of double standard concerning Peter’s behavior vs. Alicia’s? As for Zach’s decision to marry Hannah, he deserves her. Enjoy France. Good riddance. Jason’s investigation into Peter had him looking guilty and then innocent. I love how nothing is ever black or white here. One piece of evidence or witness statement can completely change the way we look at a case, and Peter’s is no different. Now things are about to get even messier. Cary has hired Louis Canning, who is trying to pull together his “Coalition of the Innocent” with Diane, who may just end up representing Peter! What does that mean and how much wine did Jackie have? 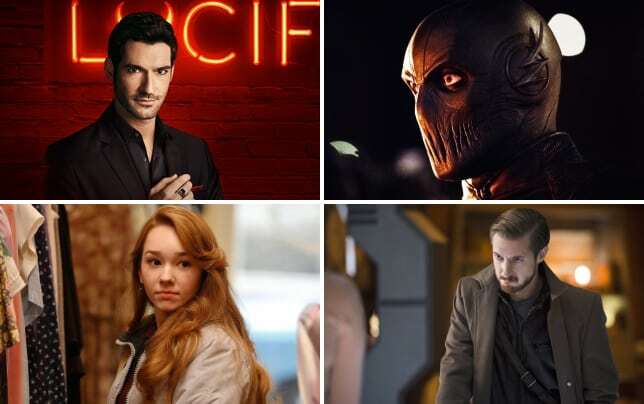 I’m assuming there’s some cryptic message in there that we’ll be able to decipher over the next two episodes but as of right now, I’m confused. One small complaint…I’ve grown tired of the TV or movies playing in the background during scenes. I know they’re generally supposed to drive home an underlying message, but I find them nothing but an annoying distraction. So, will Peter end up going to prison? Does Kurt McVeigh hold the key to the missing bullets? Will Alicia choose to run off with Jason over partnering with Diane? 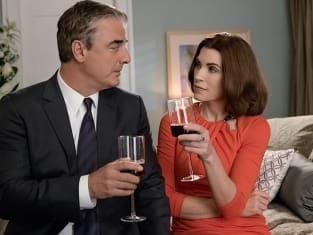 Check back later this week to find out what our The Good Wife round table team has to say, and if you can’t wait until then, you can watch The Good Wife online here at TV Fanatic.